One of my defining quests is the longing for each moment to be infused with a dynamic relationship with the earth. Personally it would feel like being deeply at home, with the aliveness that I feel when I’ve had a chance to immerse myself in wildness. Collectively this would look like environmental sustainability and social justice. Yes, our bodies are nourished by the earth. In fact the elemental make-up of our bodies is very similar to the elemental make-up of the planet. AND, our bodies have arisen out of the generations before us. Baker-Fletcher reflects on how the DNA we inherit from our parents includes DNA from our earliest human ancestors, to the first mammals, all the way to the beginning of evolution on our planet. With this expanded understanding of ancestors, we can appreciate billions of years of life and evolution as the ancestors of our bodies. I’m inspired by how Carol Christ has also developed her sense of ancestry as arising out of place. We are born not just of our mothers, but also of particular location on the earth. She honors this artfully in the way she names her matrilineal line. 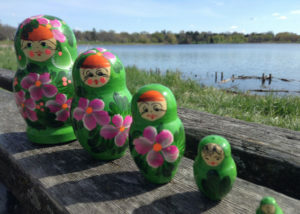 I have had a few opportunities to name my matrilineal line and when I do so I’m always struck by how I feel like I’m a matryoshka nesting doll. It is very beautiful. While I know the names of five generations of women, I can’t remember where they lived, what their lives were like, and how my family story fits into history. Thankfully some enthusiastic genealogists in my family can help me out on some points. But there is still more work for me to do. Here is an example of where Carol Christ lands. It includes information from DNA testing which identified an ancestress of the “T” line of mitochondrial DNA, which researcher Bryan Sykes refers to as the Tara clan. Goddess and God in the World, page 168. How much are you able to tie your ancestry to place? How do you experience your ancestry bringing you into deeper intimacy with the earth? Celebrate all the lives that have sustained yours. Early Bird registration deadline is Monday October 8. Learn more and register. Hamline University is hosting a series of lectures and conversations with these two prominent feminist theologians. Wisdom Dances is bringing movement to a November 3rd event around the themes of “Reimagining Goddess and God in the World” and “Seeking the Divine in a Broken World.” Learn more.